But for veteran Singapore actor Lim Kay Tong, it was twice the charm. Lim was the only Singapore actor to win at this year’s ATAs (Dec 3), nabbing the Best Supporting Actor win for his role in the HBO Asia drama Grace. He previously won in this category in 2010 for his role in the critically-acclaimed MediaCorp Channel 5 drama The Pupil. And here’s the best part: Lim was not present at the show until just a few minutes before his category was called up. His reason? Just like any other normal human being, he has errands to run. (He is also a grandfather and, yes, sometimes helps out in babysitting duties). But that’s not to say he wasn’t happy with his win. The acting veteran said his happiness is a bit more measured these days. In his acceptance speech, he credited the win to HBO’s gumption in hiring a cast and crew made mostly out of Singaporeans and setting high expectations for production and cast quality, which allowed the local team to truly shine. “The director gave (the actors) a lot of creative space and all the actors had the freedom to be creative. I was gratified to HBO – an international outfit – to have the faith and the trust (in Singaporeans). The fact that they were nominated for eight awards (at the ATAs) shows the quality of the projects and the potential in the future for international projects to have Singapore-based creative talent, not in the sporadic way that I have been used to, but in a continuous way,” said Lim. Lim hopes that Singapore talent are given even more opportunities to shine on the international stage, especially when he believes the city-state is still at its infancy as compared to other entertainment giants such as China and Korea. In his words, “we have some catching up to do”. The gala dinner night happened the day before (Dec 2), where creative and technical awards were handed out. Among the Singapore winners were Channel 8 (Best Theme Song, The Journey: Tumultuous Times) and Channel NewsAsia (Best Social Awareness Programme, Little People, Big Dreams). While HBO Asia received a nod for its efforts in original content (Best Editing, Steve Evans for “Grace”) MTV Asia won Best Entertainment Show (One-Off/Annual) for MTV Music Evolution Manila Hip-Hop 2015. Hosting the gala dinner were half of the four hosts: Max Loong and Munah (pictured above). The other two hosts were Joey Mead King and Allan Wu. All four are represented by FLY Entertainment. The ATA wins are decided by a panel of 63 judges from the Asian television industry. 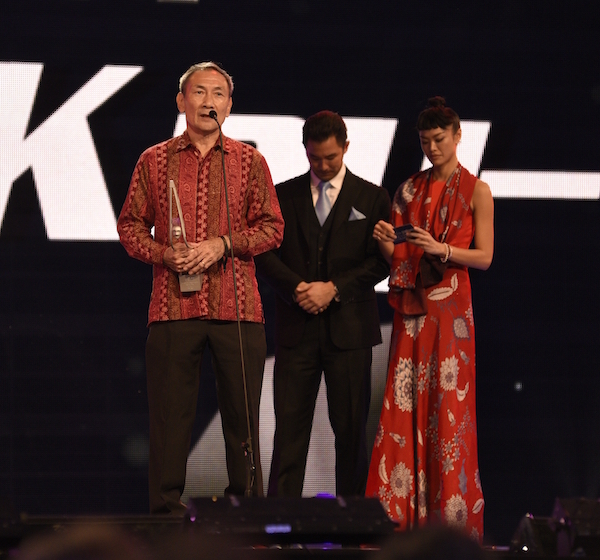 Discovery and MediaCorp ended up big winners that night, sweeping the top four awards for terrestrial and cable channels and networks.